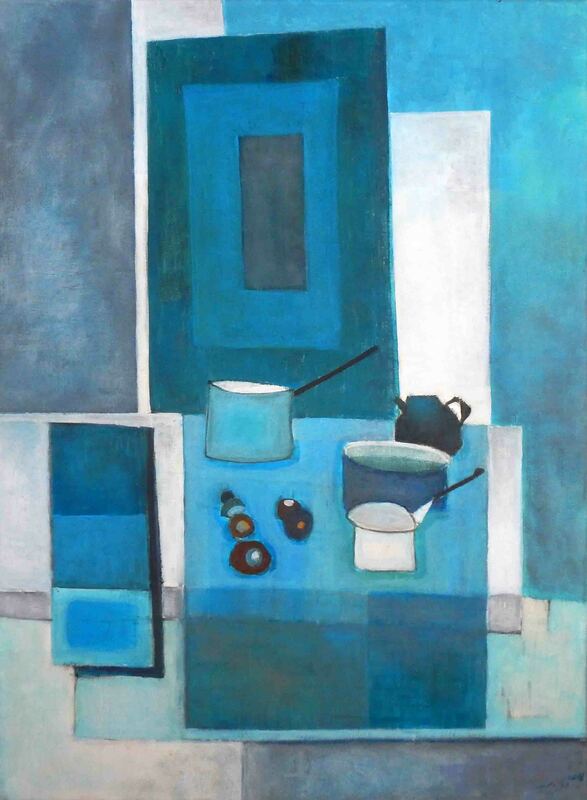 Kitchen is an original acrylic painting on canvas of a kitchen utensils and chestnuts, painted by an emerging artist. Contemporary interpretation of Still Life. I used only acrylic paints and brush – different shades of blue color enhanced with grey and white. Contemporary background without frills. Still life depicting kitchen utensils and chestnuts arranged on the table. In addition signed on the front, protected with a fixative, certificate of authenticity. A still life is a work of art depicting mostly inanimate subject matter. Still-life painting emerged as a distinct genre and professional specialization in Western painting by the late 16th century, and has remained significant since then. Still life gives the artist more freedom in the arrangement of elements within a composition than do paintings of other types of subjects such as landscape or portraiture. Some modern still life breaks the two-dimensional barrier and uses even mixed media. Still life emerged from the painting of details in larger compositions with subjects, and historically has been often combined with figure subjects, especially in Flemish Baroque painting. Generally a still life includes a fully depicted background, and puts aesthetic rather than illustrative concerns as primary. Note: Using images of paintings can only be done with the written agreement of the artist.